We just released SQL BAK Explorer, which is a useful tool to work with SQL Server backup files. Basically, it can read the backup details off the backup files without requiring SQL Server. The details it can provide are almost similar to what you can retrieve using the RESTORE HEADERONLY and RESTORE FILELISTONLY commands. It supports backup files created using SQL Server 2005 up to SQL Server 2017. However, it doesn’t support encrypted backup files. Beyond just listing out the backup details, you can also view the details of multiple backup files simultaneously, in a summary window. This makes it easy to compare backup set details. 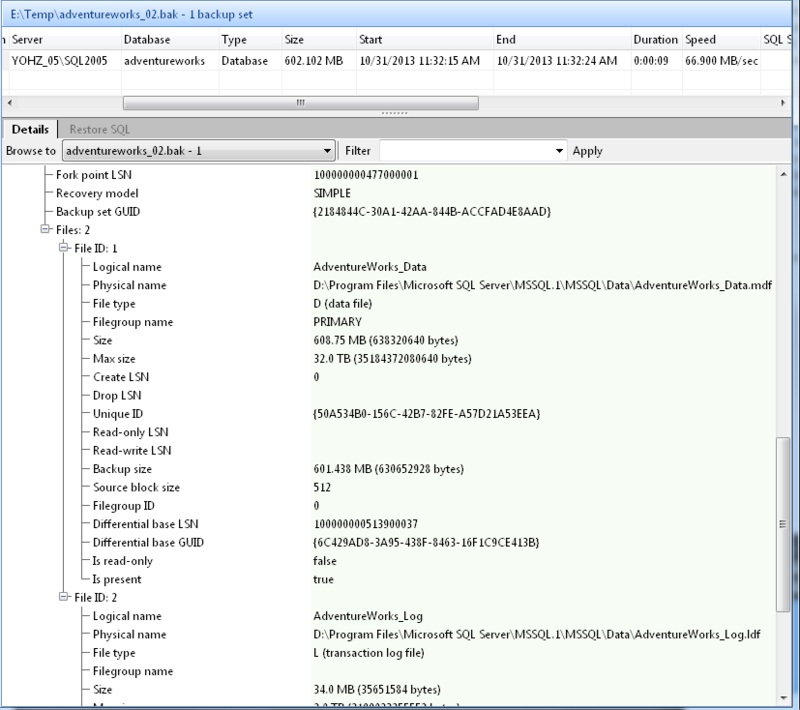 Since we already have the backup details, SQL BAK Explorer can also generate the restore script for you. The restore script for a full database backup will include the MOVETO options, so that you can easily move the database files around. Hints are also provided on how much disk space is required. 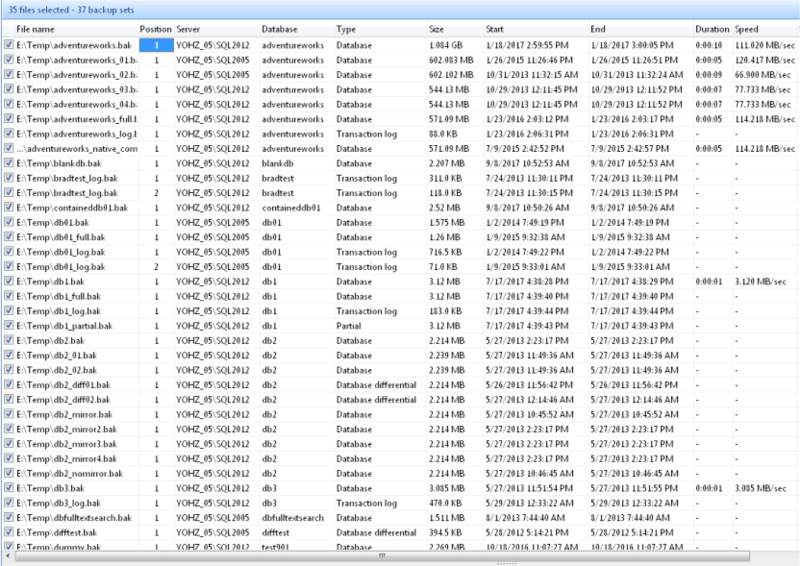 Each time a backup file is read, SQL BAK Explorer stores the backup details in a local database. The next time the same file is selected, the details are read from the database instead of re-reading the file again. This allows the backup details to be displayed very fast. In addition, SQL BAK Explorer can search this database for files making up a complete backup media set, when generating the restore script for a backup that has been split across multiple files. If there is anything you would like to see added to SQL BAK Explorer, please do drop us a line at support@yohz.com. Download the free 14-day trial now, or learn more about SQL BAK Explorer. This entry was posted in SQL BAK Explorer and tagged SQL BAK Explorer, SQL BAK Reader, SQL Server on September 19, 2017 by bloggyadmin.